Virginia Woolf was born in London as Adeline Virginia Stephen in 1882. The daughter of the eminent editor and biographer Sir Leslie Stephen had a turbulent upbringing and it utterly defined her later life as an author. When she was just thirteen years old, her mother, Julia Prinsep Stephen, suddenly died and then just two years later so did her half-sister Stella. Although these losses caused great pain to Virginia, her father's passing in 1904 was a catastrophic loss that sent her spiralling into depression. The on-set of which had begun much earlier because neither of her parents had been aware of the sexual abuse she, and her sister Vanessa, had been subjected to throughout their childhood by their half-brothers George and Gerald. These events provoked frequent mood swings and nervous breakdowns, resulting in Virginia being institutionalised on three occasions. The one constant thread which she clung to, was her writing. "I hold myself from writing till I have it impending in me: grown heavy in my mind like a ripe pear; pendant, gravid, asking to be cut or it will fall." She had begun this journey with a childhood fascination for the actual pens themselves, and how each one gave her writing hand a different feel. The search for the perfect pen, developed into an experimentation with language itself, and a passion for understanding the motives of characters. The sibling rivarly with her sister, who claimed painters had a harder life due to standing up for hours on end at their canvas, led Virginia to write standing up in the early part opf her career. Her 3’6″ desk allowed her to step away as if she were herself a painter viewing their canvas, and she took much delight in ensuring her sister observed this too. After her first publication of an article in 1904 for The Guardian, Virginia sustained herself through numerous paid commissions from The Times Literary Supplement. The regular income from writing faciliated her move to a new home in Bloomsbury so she could focus her ambition. This avant-garde community, with their shared love of the arts, resulted in the formation of the Bloomsbury Group. Their reactionary lifestyle to the conventions and bourgeois habits of the Victorian age, enabled Virginia to spread her wings as a writer. She was actively encouraged to experiment artistically and sexually, leading to an affair with an associate's wife. Within this artistic circle, she encountered and later married Leonard Woolf in 1912. Leonard not only gave her the name for which she is known, but also the kindess and support she had craved since her parent's death. As a fellow writer, Leonard frequently promoted his wife's writing because he was determined to see her endeavours in print. So much so, that just five years later in 1917, they founded the Hogarth Press, and began hand-printing her fiction to the masses. It is this often ignored aspect of her career that shows just how ahead of the times she truly was: all of her novels were self-published. This publishing freedom, combined with an experimental creativity, saw the release of a succession of uniquely stylistic novels by Virginia Woolf. *Published by her half-brother's company Gerald Duckworth and Company. **First release under Hogarth Press. 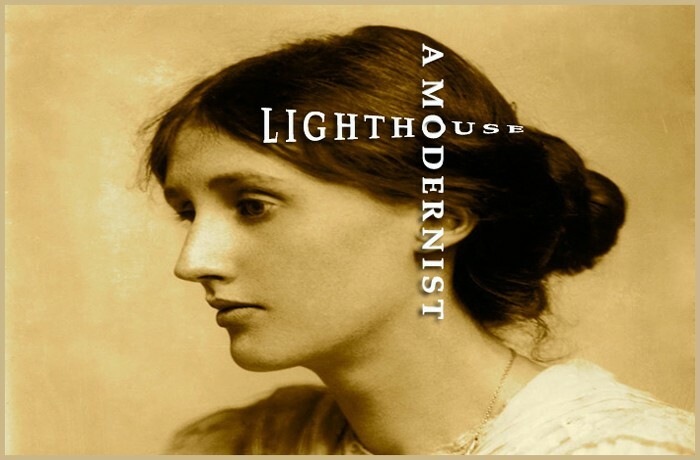 Of these nine novels, two have always leaped off the shelves, akin to the way their fiction leaps off the page: Mrs Dalloway and To the Lighthouse. Both of which are often cited by modern scholars and novelists as two of the greatest books ever written. The way in which she contorts the narrative, and plays with the stream of consciousness using visionary poetic prose, has seen Virginia Woolf heralded as a leading founder of modernist literature. This non-linear approach to storytelling is openly encouraged in literary fiction today, and has even seen some authors win the Pulitzer Prize for Fiction. But in Virginia Woolf's era, it was ground-breaking, and arguably never bettered. Virginia and Leonard divided their time between Bloomsbury, and their eighteenth-century cottage in Rodmell, Monk's House. During which, they oversaw the growth of Hogarth Press into a leading publisher of such contemporaries as T.S. Elliot, until Viriginia relinquished her interest in the company in 1938. Unfortunately, just four years later, the bouts of depression which had plagued her life, worsened under the strain of the WWII Blitz. 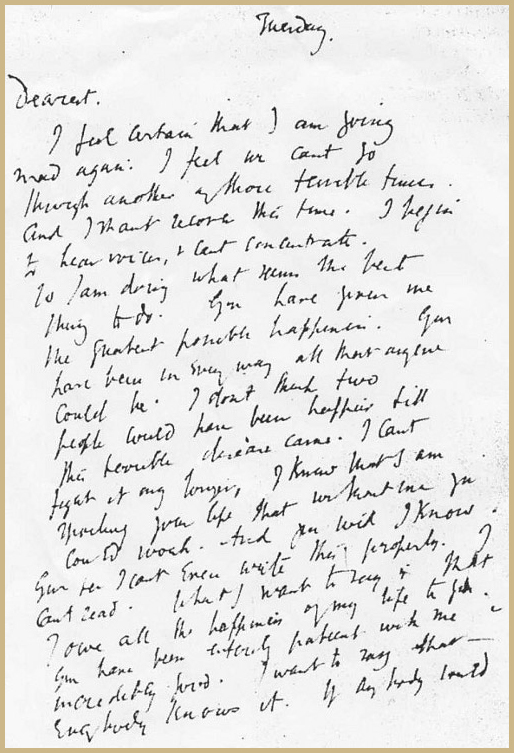 As bombs destroyed London, and the Woolf family home, Leonard picked up a letter dated March 28th 1941, and began to read. The poignant words were the final ones of his loving wife: Virginia Woolf. I feel certain that I am going mad again. I feel we can't go through another of those terrible times. And I shan't recover this time. I begin to hear voices, and I can't concentrate. So I am doing what seems the best thing to do. You have given me the greatest possible happiness. You have been in every way all that anyone could be. I don't think two people could have been happier 'til this terrible disease came. I can't fight any longer. I know that I am spoiling your life, that without me you could work. And you will I know. You see I can't even write this properly. I can't read. What I want to say is I owe all the happiness of my life to you. You have been entirely patient with me and incredibly good. I want to say that—everybody knows it. If anybody could have saved me it would have been you. Everything has gone from me but the certainty of your goodness. I can't go on spoiling your life any longer. I don't think two people could have been happier than we have been. Virginia Woolf's 59-year-old body was found three weeks later. Filling her pockets with stones, she had drowned herself in the River Ouse near their Sussex home of Monk's House. Her rejection of writing structure, traditional publishers, and finally life itself, came from a determination to live and work on her own terms, free from the controlling forces of her childhood. Writing had given her the confidence that her younger self had lacked, had needed. Virginia Woolf had no interest in writing books like everyone else. For her, fiction should transcend the boundaries of structure. The shackles of the three-act novel inhibited her voice. A voice which weaved innovative narrative threads upon which hung fascinating singular snippets of concepts and ideas. She broke the rules, to show the world how great literature can truly be when you cast aside the anchor of convention. "So long as you write what you wish to write, that is all that matters; whether for ages or only for hours. To sacrifice your vision is the most abject treachery." So it is of no wonder that over 70 years since her writing hand stopped, that her fiction continues to be studied as well as read. Virginia Woolf is a beacon of literature: a shining light for the new generations of readers, who will forever fall in love with her prose, and for the authors, who will forever write in her shadow.